Prevention is key to reducing your pet's future medical bills, as well as ensuring their comfort and safety for years to come. Your pet benefits greatly from regular wellness examinations. Whether your pet is a youngster, a "senior citizen," or any age in between, wellness examinations provide an excellent opportunity for us to conduct a thorough physical examination and develop a health profile for your pet. This information will help us identify medical problems and any other issues that can affect your pet's health and quality of life. . Click Here to see a video of what is involved in a Physical Exam for your pet. Also, having a blood test performed on your pet early on while they are healthy is a great way to set a "benchmark" for your veterinarian. Having a snapshot of what their levels and blood cells look like when they are healthy can help your veterinarian tremendously down the road if your pet should become sick. Finally, wellness examinations help us establish a relationship with you and your pet. Through your pet's physical examinations, other wellness procedures, and our consultations with you, we get to know your pet and learn about his or her lifestyle, personality, health risks, home environment, and other important information. 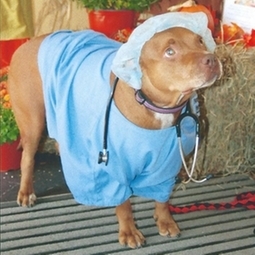 We encourage you to take an active role in your pet's health through preventative care. Our new home services make it even easier for you to provide quality preventative care and vaccinations for your pet in your own home. Let us come to you!